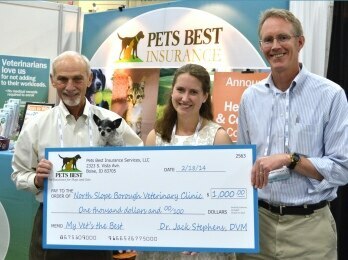 LAS VEGAS – Pets Best Insurance Services, LLC (Pets Best), a leading U.S. pet insurance agency, has named Dr. Sarah Coburn the 2013 grand prize winner of its nationwide My Vet’s the Best contest. Dr. Coburn practices at North Slope Borough Veterinary Clinic in Barrow, Alaska, which is the sole source of veterinary care within an 89,000-square-mile area. Pets Best created the My Vet’s the Best contest in 2010 to recognize outstanding veterinarians and provide funding for the treatment of animals in need. The agency awards several seasonal winners each year and announces one annual grand prize winner during the Western Veterinary Conference in Las Vegas. Nearly 1,000 veterinarians received nominations from grateful pet owners during the 2013 contest. Dr. Jack Stephens, president and founder of Pets Best Insurance, announced Dr. Coburn as the grand prize winner today at the Western Veterinary Conference. Dr. Coburn, who was selected from a group of 24 grand prize finalists across the U.S., received a check for $1,000 to support her ongoing efforts to address animal health issues in her region. Dr. Coburn said she plans to use the prize money to provide shelter and insulation for outdoor dogs that otherwise would not have protection from the frigid arctic weather. Dr. Coburn practices at a clinic in the northernmost town in the U.S. that overlooks the Arctic Ocean and is accessible only by plane. Facing extreme weather while traveling to remote areas, Dr. Coburn overcomes a host of challenges to treat local animals. With no private veterinary practices in the region, Dr. Coburn’s clinic is funded by the North Slope Borough government, requiring her to offer a wide variety of services. She regularly takes flights to several surrounding villages to provide veterinary services, including rabies shots and spaying and neutering. When animals experience emergencies, owners typically fly their pets to the clinic. In addition to treating household pets, Dr. Coburn has also treated a wide range of wildlife, including birds, snowy owls and walruses. She is scheduled to assist the veterinary team dedicated to examining and treating dogs this year during the world-famous Iditarod dog sled race. With such limited public health resources in the area, Dr. Coburn even assists state health inspectors with inspections at local restaurants. Coburn has a master’s degree in clinical sciences and a Doctor of Veterinary Medicine from Colorado State University. Dr. Coburn received multiple nominations for My Vet’s the Best in 2013, and she frequently receives praise from pet owners who could not provide care for their animals without her. In 2010, Pets Best became the nation’s first pet insurance agency to develop a contest aimed at recognizing the country’s best veterinarians. While voting for the contest’s seasonal winners is open to the public through the Pets Best website and Facebook page, each year’s grand prize winner is selected by an internal review panel comprised of respected veterinary professionals. The grand prize winner receives $1,000 to treat animals in need, as well as a trip for two to the Western Veterinary Conference. For more information about the My Vet’s the Best contest, visit www.petsbest.com/blog/my-vets-the-best-contest. First photo above: Dr. Sarah Coburn, center, receives $1,000 for the treatment of animals in need from Dr. Jack Stephens, left, president and founder of Pets Best Insurance Services, LLC, and Chris Middleton, chief operating officer of Pets Best. Pets Best named Dr. Coburn the grand prize winner of its 2013 My Vet’s the Best contest on Feb. 18 at the Western Veterinary Conference in Las Vegas. 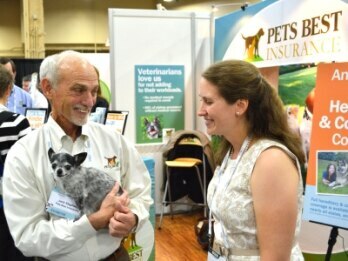 Second photo above: Dr. Jack Stephens, president and founder of Pets Best Insurance Services, LLC, speaks with Dr. Sarah Coburn, grand prize winner of the agency’s 2013 My Vet’s the Best contest, at the Western Veterinary Conference in Las Vegas on Feb. 18. Dr. Jack L. Stephens, president of Pets Best, founded pet insurance in the U.S. in 1981 with a mission to end euthanasia when pet owners couldn’t afford veterinary treatment. Dr. Stephens went on to present the first U.S. pet insurance policy to famous television dog Lassie. Pets Best provides coverage for dogs and cats and is the only veterinarian founded and operated pet insurance company in the United States. Dr. Stephens leads the Pets Best team with his passion for quality pet care and his expert veterinary knowledge. He is always available to answer questions regarding veterinary medicine, pet health and pet insurance. The Pets Best team is a group of pet lovers who strive to deliver quality customer service and value. Visit www.petsbest.com for more information.